Recently, the media and the Internet have been abuzz about how soft drink giant Coca-Cola, through its initially furtively funded “scientific,” non-profit energy-balance group, erroneously claims that Americans are getting fatter because they’re not exercising enough, not because they’re drinking soda. To reply to such an absurd, head-shaking conclusion, I conferred with talented cartoonist Isabella Bannerman, with whom I recently started Sugar Shock Funnies. See our cartoon-response below, and free to share it on Facebook, Twitter, etc. after you’ve sadly smiled. In case you missed the controversy, here’s a quick recap: Thanks to this brilliant New York Times expose from reporter Anahad O’Connor, we now know about Coke’s efforts to get soda-drinking Americans to wrongly think that they’re gaining weight because they’re not working out enough, not because they’re drinking soft drinks. That’s just flat out untrue. Of course, as you know, soft drinks are empty calories. They lack nutrients, minerals, vitamins, minerals, fiber, and essential fatty acids. But the empty-calorie angle presents only a very small piece of the story. What troubles me about discussions regarding soda and its role in weight gain is that all too often, the soda-disease connection is overlooked. Drinking a lot of soda doesn’t just lead to weight gain. Your soft-drink habit, or rather, addiction, can lead to heart disease, cancer, type 2 diabetes, and more. The fact remains: Too much soda and other sugar-filled beverages such as fruit drinks, energy drinks, etc. can cut your life short. Indeed, the American Heart Association study recently revealed that sugary drinks kill 184,000 people worldwide each year, with 52,000 in the United States. How sad. Around the world, 184,000 are dying annually because of their addition to sweet drinks.. So back to the Times article, “Coca-Cola Funds Scientists Who Shift Blame for Obesity Away From Bad Diets.” Not surprisingly, reporter O’Connor’s well-researched piece prompted a flurry of replies and thoughtful articles on Slate, U.S. News and World Report, the Washington Post, other media outlets and health experts. My favorite response came from the well-respected Michael F. Jacobson, president of the Center for Science in the Public Interest and author of “Liquid Candy: How Soft Drinks are Harming Americans’ Health,” and Walter Willett, M.D., M.P.H. professor and chairman of the department of nutrition at Harvard T. H. Chan School of Public Health. In their succinct New York Times op ed piece, “Coke’s Skewed Message on Obesity: Drink Coke. Exercise More,” they wrote: “The scientific nonsense being peddled by the Coca-Cola-funded Global Energy Balance Network is outrageous.” The letter was signed by 34 others in the fields of public health and medicine. I also urge you to read the New York Times’ Op Ed board’s piece, Coke Tries to Sugarcoat the Truth on Calories. Then share your thoughts. 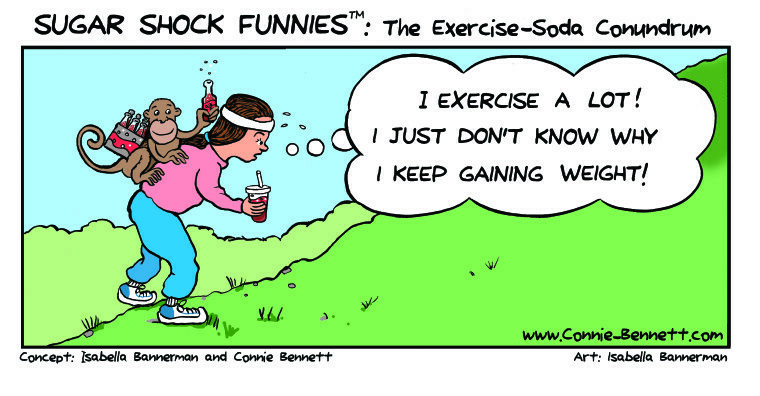 What do you think of Coke’s move to blame lack of exercise, not soda, on weight gain? And are you addicted to soft drinks? cheap generic viagra Do your cravings make you frustrated, frazzled and overweight? order now This fun, fascinating, science-based, Cravings-Crushing, Quick-Start Guide will click here whisk you away http://sanfordbiggers.com/bio order now from temptation for sugary, salty, fatty junk non-foods and and into the glorious, delicious, liberating world of self-control.